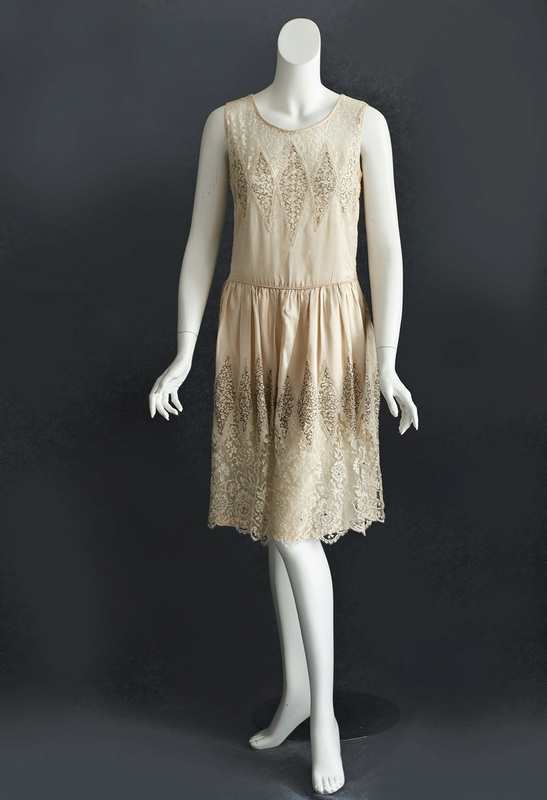 Flapper dresses are perennial favorites because no other period combined such opulence with such youthful sass. 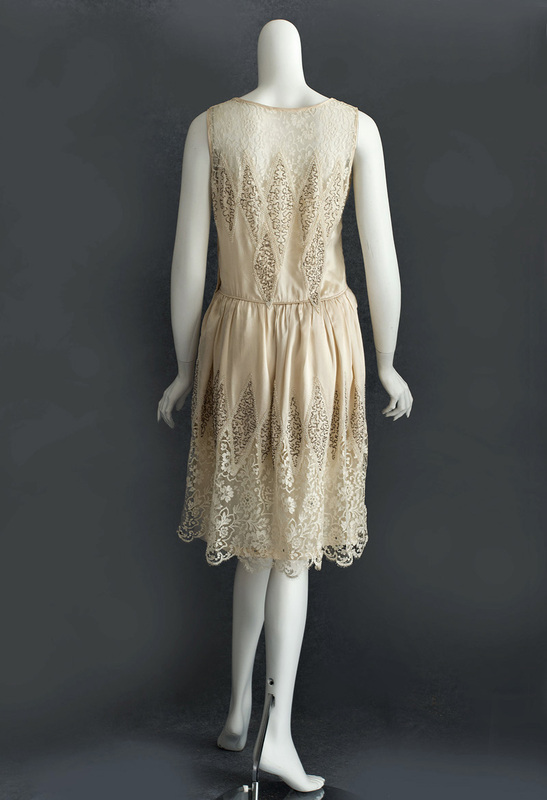 Whether hard edged Deco or softly feminine in style, the flirty short dresses were the personification of the party-till-dawn mood of the era. The Roaring Twenties came to an abrupt end with the stock market crash of 1929. 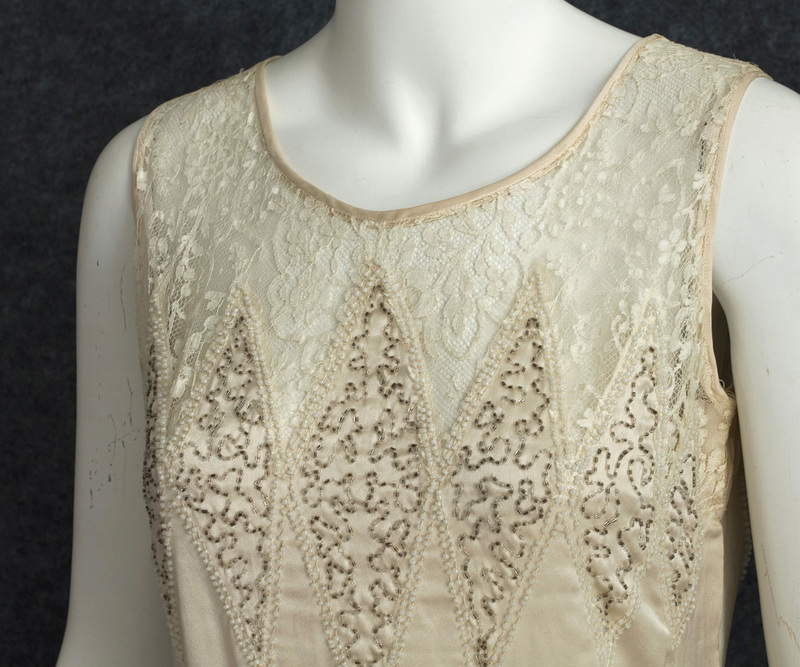 This explains why the flapper dress was a short-lived style of only 5 years; and why today it is so hard to find fine flapper dresses. The loose fitting, drop-waist style is comfortable and easy to wear. The dress closes on the side with hooks and snaps. The drop waist is outlined with self corded piping. The neckline and armholes are self bound. 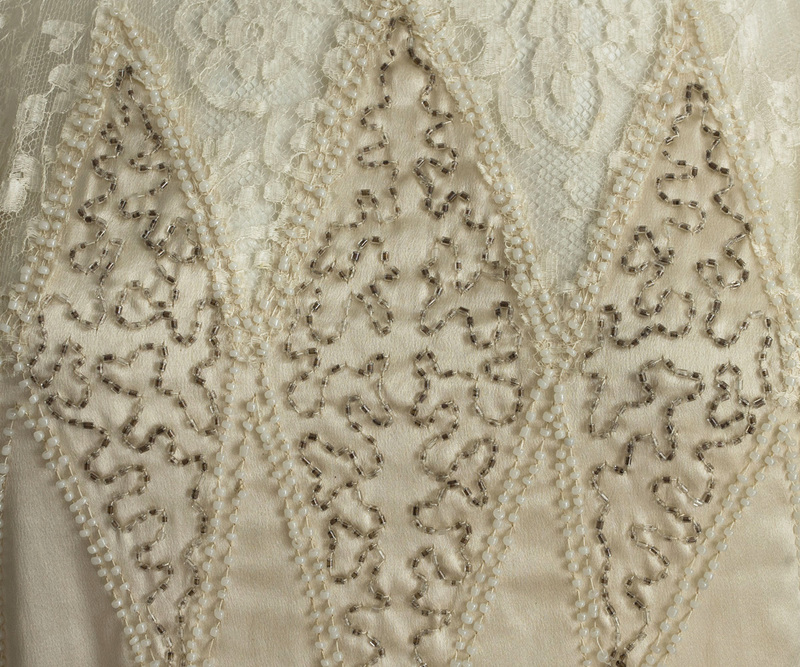 The half slip, attached at the drop waist, is of matching China silk. 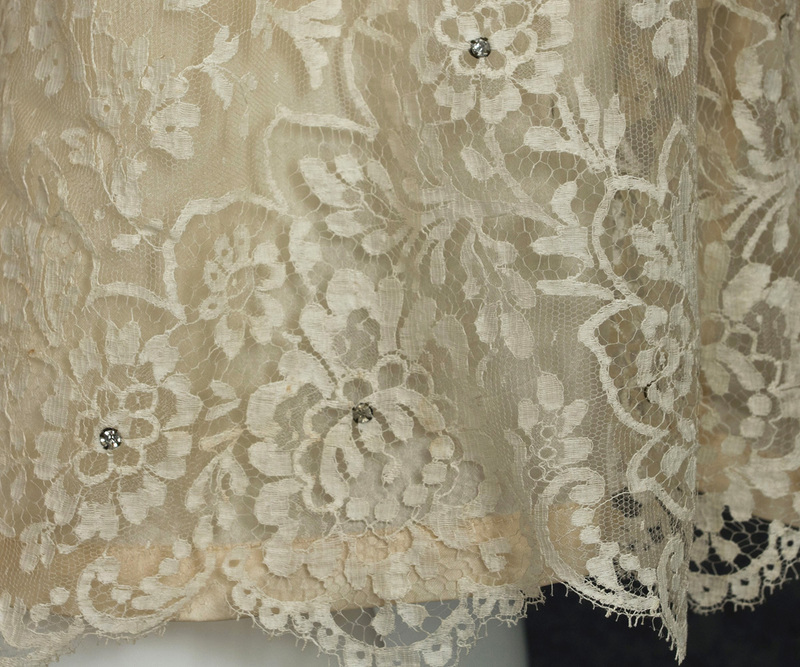 Wide borders of matching lace around the neckline are mirrored around the hem. 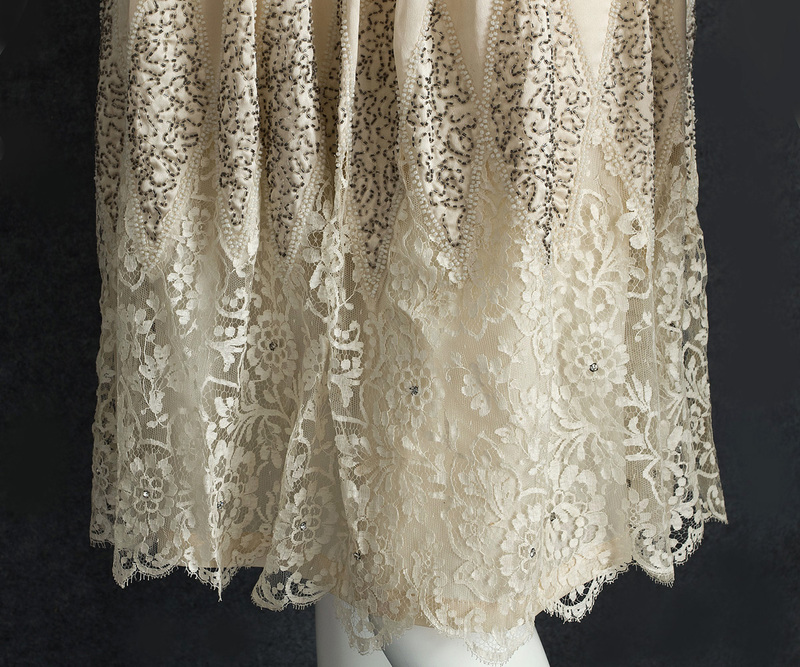 Glittering rhinestones dot the lace hem border. Our fetching, ultra-feminine dress is embellished with rows of large beaded diamonds that sparkle with small faux pearls and silver-lined crystal beads. Here is a designer indeed who was alive to the vision and power of beauty, keen, subtle, delicately poised, and possessing the secret of loveliness. This ivory satin dress would be perfect for an informal wedding. The condition is excellent and wearable. I could not find any problems. It measures: 36" bust, 31" waist, 44" hip on the lining (outer skirt is fuller), 19" from shoulder to drop waist, and 42" from shoulder to hem.